View segments in a particular group by clicking the group name in the key. You have been invited to view this profile. If you would like to add notes or make edits, you can copy this into a new profile of your own. The process of painting a match involves some copying and pasting of data. While you can do this on a touch device, you might prefer to use a desktop browser! We found X segment in your match data (excluding segments under 7cM). I know how I'm connected to this match I don't yet know how I'm connected to this match. Optional – This is just so you can identify the source of this segment in future. You could also enter their DNA kit number or username. This match does not overlap with any previously painted segments. If you know how you are connected, you can label these segments with the name of the ancestor you got them from. You're both descended from your 2nd-great-grandparents Charles and Mary. The furthest back individual you can assign these segments to is their son John Smith, your great-grandfather. Or you could use to use the name of the ancestral couple, Charles and Mary. If you know only the approximate relationship (e.g. if the location implies this person is related via a particular grandparent), you can enter the name of the furthest back individual (e.g. that grandparent's name). 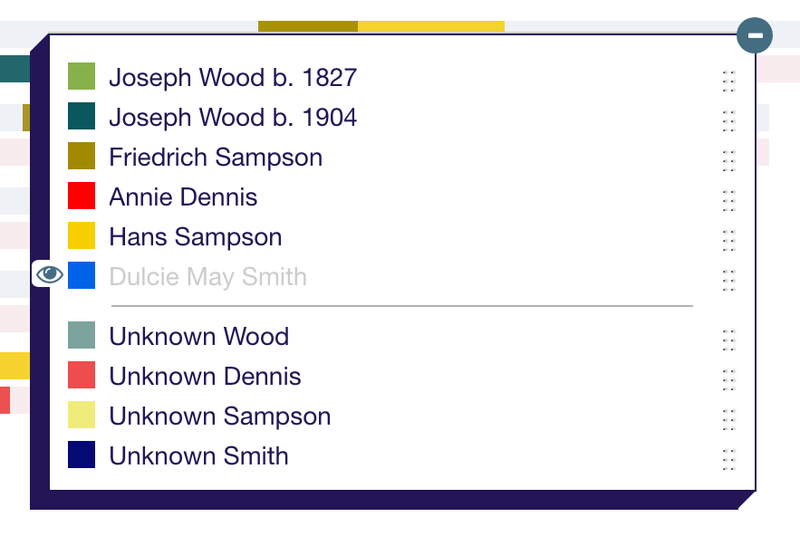 If you have multiple ancestors with the same name, you might like to include their birth year. Is this match on your mother's side or your father's? Each pair has one chromosome from your father and one from your mother. Do these segments look like they're from the maternal or paternal side? Please ensure you've selected a group. The site couldn't find any segments over 7cM in the data you pasted in. Chromosome number, segment start position and segment end position. If you're trying to import ethnicity segments from 23andme, please use the form here! And for MyHeritage data, you can't copy from the segment popup - please see instructions here. If everything seems right and it's still not working, please copy and paste the exact text you're pasting in and email it to info@dnapainter.com along with *both* a) the site you're copying the data from and b) the name of the browser you're using. Thanks! Paste in segment data here (e.g. from Gedmatch/ftDNA/23andme/MyHeritage) for a single match. Multiple rows is fine! This tool is for users who have imported a file from ftDNA, and who have had a parent tested. Upload your Family Finder matches file, which you can download using by clicking the 'Download Matches' button at the bottom of your ftDNA matches page, or if you're already logged in to the correct account, by clicking this link. This is a beta tool and I highly recommend backing up and/or duplicating your profile before using it. Please select a file to upload first! The file you uploaded doesn't appear to be one we can accept! It looks like you may have uploaded the Segment Matches file. For this tool, the site needs the Family Finder matches file (see above). There do not appear to be any ftDNA import groups in this profile. No segments labeled as maternal or paternal were found. Did you definitely unzip and select the correct file? If so, your file itself may be invalid; for example, ftDNA download files occasionally include illegal quote characters within fields. To fix, open the file in Microsoft Excel or similar, and then re-export the CSV file from this program. This will escape the necessary characters and your file should upload fine. Or: Try the tool at http://convertcsv.com/csv-viewer-editor.htm. To use this external tool, browse for your file under 'Select your input', wait for it to process, and click 'Download CSV'. The resulting file will be called convertcsv.csv and should import to DNA Painter without any problem. To proceed with the import, browse for the file from your computer below and click 'Import ftDNA Match info'. Paste in segment data here from 23andme. A separate group will be created for each ethnicity. 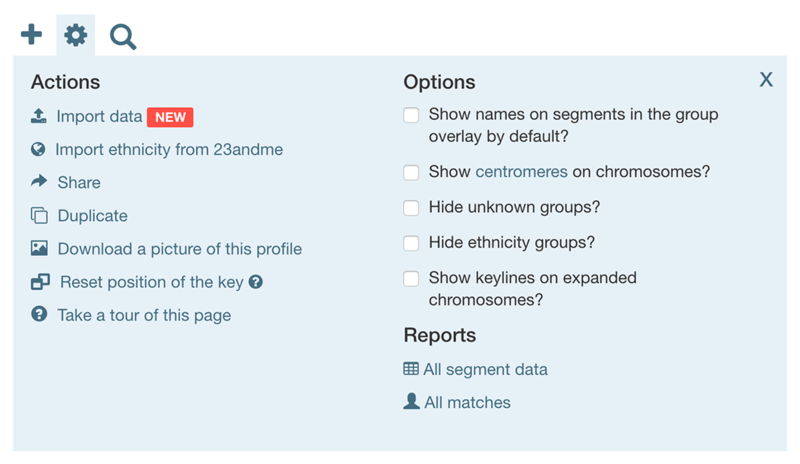 To download the data from 23andme, click 'Download raw data' on this page. Please confirm you want to delete all ethnicity segments and groups. Please note - if you've moved other matches into the imported groups, these will also be deleted! Please enter a name for the new group! Move () to another group? Please note: anything typed here will overwrite any individual segment notes you may have entered for this match! Set a confidence level for the group Optional: indicate how certain you are that you've identified these segments correctly for the entire group. Notes Text only please! Links starting with http:// and https:// will be converted to hyperlinks when this text is displayed. Please confirm you want to delete this group and all the matches within it. Please ensure the start and end are numeric, and that the value for the start of the segment is less than the end! Chromosome number should be 1-22 or X. Please choose a group or enter a name for a new group! This will duplicate this segment, allowing you to 'split' it and assign different sections to different groups if you need to. Clicking 'Confirm Copy' below will take you to the edit page for the new duplicated segment. A DNA Painter profile is a set of blank chromosomes that represent an individual who has taken an autosomal DNA test. When you have a DNA match, you will match on particular segments. The aim of this site is to provide a platform that lets you take this match segment data and use it to 'paint' your chromosomes (or those of the person who took the DNA test! ), adding as much information as possible so that you can use this info to help trace future matches. You can choose whichever colours you like. For known connections, it can be a good idea to assign a distinct colour to each of the four grandparents, and then use variations of these. For more information on how to set up a profile, click the Settings cog at the top left and then click on 'Tour of this page'. Who is this profile for? Welcome. Here's an overview of the new features released in September 2018. At the top left of your profile, just above the first chromosome pair, you'll see three new buttons. When you hover over a button, a tooltip appears explaining what it does. Click a button to expand/contract the chromosomes, view settings, or perform a search. A simple and much-requested feature has been added: there's a '+' icon that will expand all your chromosomes at once. After you click this button, it will transform into a '-' that you can click in order to minimize them again. You can still expand and contract chromosomes individually. After you expand all chromosomes, match names will show automatically. You can toggle this using the checkbox that appears above each expanded chromosome. Any options you select will be saved in your browser's local storage and will persist until you reset your browser or empty its cache. DNA Painter now features an auto-complete search. All segments will be paled out and the matching segments will be highlighted. The first matching segment will have hover state expanded. Click 'clear' or the 'X' icon on the search panel to clear the search and restore the segments to their normal state. As well as adding individual matches, you can now bulk import your match segments from a comma-separated-values (CSV) file. The CSV file can be directly from your testing company (e.g. the CSV file of segment data provided by MyHeritage, FamilyTreeDNA or 23andme) or custom file (a template is provided in the import overlay). Please note: to use the import functionality, you need to subscriber. Previously, the only way to view a match was within its group. While this was useful for comparing the match with other grouped segments, it didn't work well for those with endogamous ancestry, since the segments they share with matches could potentially be assigned to different ancestors. You can reach the new match overlay by clicking on any segment and clicking 'view match', by hovering over the match name in the 'All segment data' overlay, or by clicking on the match name in the group overlay and clicking 'view or edit match'. Overlap notices - a 'fuzzy threshold' of 2 million base pairs has been added so that fuzziness in matching algorithms/builds doesn't lead to false positives. Application flow. Previously, after you performed an action, what tended to happen was that the window you were working on would close and you would be returned to the main view of chromosomes. This could get annoying for users working within a particular group or chromosome. Now, the application will endeavour to return you to where you were before. Multiple segment deletion. In the 'all segment data' view, you can now click 'mark for deletion', and a column will appear with checkboxes. There's also a checkbox in the table header to select all visible segments. You can use this to filter the table for the things you want to delete and then select them all. Once you click 'Delete segments', the site will say how many segments you are deleting and remind you that this action can't be undone. If you confirm the deletion, the segments will be deleted and the 'all segment data' window will reload. Search the key - if you have a lot of groups it can be hard to find the one you're looking for. If you have more than 30 groups, a search box now appears so that you can filter them to find the one you want more quickly. The site is still free, but a subscription is now required for serious users who would like to use the new bulk import functionality and/or have multiple profiles. You are viewing all segments where a match name was not entered. This may include segments from more than one match. If you click 'edit match,' all these segments will be edited. If you click 'delete match', all these segments will be deleted. To avoid this, please edit the segments individually by clicking on a segment and clicking 'edit segment'. Since your match includes segments that you haven't placed on a specific maternal or paternal chromosome, these people may not be related on the same chromosome. If possible, compare these people directly (e.g. via a one-to-one comparison on Gedmatch, or in MyHeritage's chromosome browser) to clarify whether or not they actually match each other. Matches To move a match to another group, click and drag on its handle. segment will be deleted. This action can not be undone. Please confirm you'd like to go ahead. This profile is currently private. To change this please click the switch below. Here is the data for the duplicate segments that were removed. If you have duplicate segments in your profile, this tool will remove them and save your profile. Caution: If you have used 'Copy Segment' to duplicate any segments, this tool will remove them if the match name hasn't changed. If in doubt, please duplicate this profile before proceeding! To make a copy of this DNA profile, please click the button below. You will then be taken to the new duplicated profile. The key lists all ancestors and groups of segments. You can make the following customisations: Please note: these functions may not all work on mobile/touch devices. If you click and drag on the 'dotted' icon to the right of each item in the key, you can pick it up and drag it into a new position. For example, you could move the group at the top to below the third group. This will have the effect of altering the layer order - so if segments from this group overlap with other segments, those segments from the group that's higher in the key will show on top. 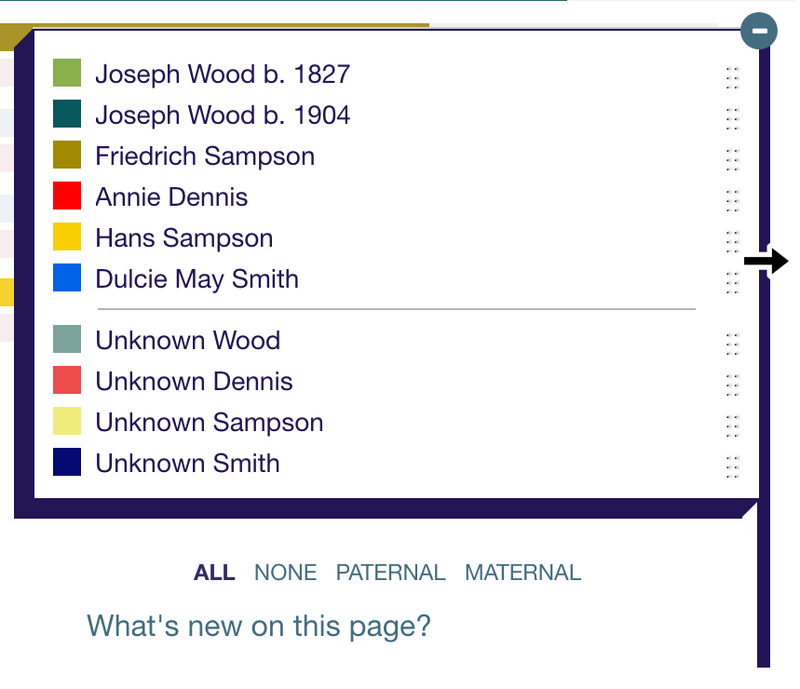 If you click on the coloured square to the left of an ancestor or group name, it will hide any segments in this group (or if you've already hidden them, it will show them). You can drag and drop the entire key by clicking on the dark area on the left of the key and dragging it into a new position. A bright blue border will appear on the left while the key is being dragged. Clicking 'Reset key position' in the settings panel will restore the key to its original position. You can extend the width of the key by clicking and dragging on its right-hand edge. A dark blue border will appear on the right while the key is being widened. You can now import a spreadsheet of matches into DNA Painter! Before importing anything, it would make sense to duplicate this profile first so you have a copy to go back to. The import process uses a signficant amount of memory, and a desktop or laptop device is therefore suggested. If you're on a mobile or touch device, you might find that this freezes the site. This profile already contains segments. Depending on how fast your computer is, importing additional segments might make it extremely slow. If you have a large file, please consider importing it into a new profile. You can import the file of segment data that is provided by your DNA Testing company, or a DNA painter CSV file, and the site will recognize the format. Where do I download the CSV of segment data from my testing company? The instructions differ for each testing company. In all cases you will need to save the file to your computer as opposed to opening it. The file is available via the button 'Download All Segments' in the ftDNA chromosome browser. The button is at the top right of the page above the list of matches. Please note that if you transferred to ftDNA, you'll need to unlock their chromosome browser before you can download your data. The file is available on the DNA Matches page by clicking the 'three vertical dots' icon at the top right of the list of matches to expand the menu. Click on 'Export shared DNA segment info for all DNA Matches' and the file will be emailed to you within a few minutes. Please unzip the file before uploading. 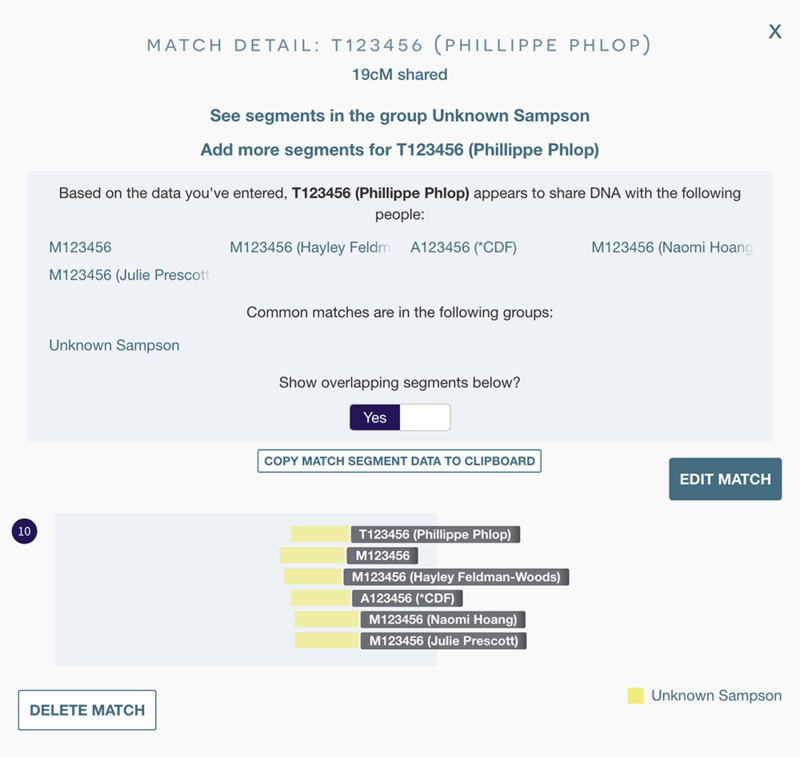 Log into Gedmatch and run the Tier 1 matching segment search on the relevant kit. Save this as a comma-separated-values (CSV) file and DNA Painter will recognise the format. This can be loaded directly into DNA Painter, or alternatively you can follow the instructions for Gedmatch, copying and pasting the table into a spreadsheet, maintaining the header row. 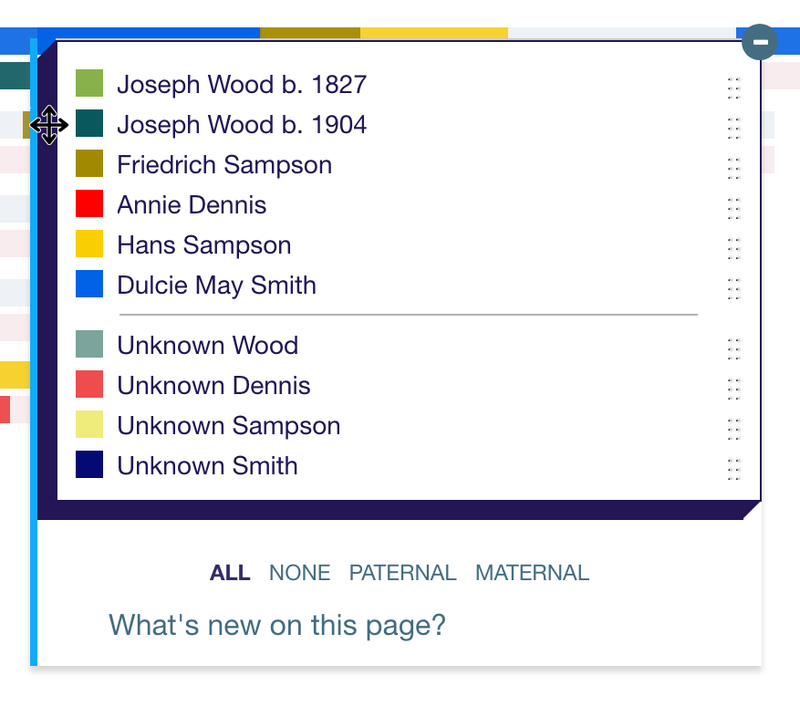 Tip: if you have a parent tested and uploaded to Gedmatch Genesis, you can run the 'Phasing' tool to create separate kits of your maternal and paternal DNA. And if you then run the segment search using these phased kit numbers, you'll be able to import your maternal and paternal DNA separately and assign the matches to the correct chromosomes by editing the imported groups! Importing a DNA painter profile To download a CSV file from a DNA Painter profile, visit 'All segment data' (the link is under the key on the right) and click the '.csv file' link at the top left. Or if you prefer, you can import a custom file of segments that you create. Files for import need to be in CSV format. To create your own file, please use this template, with the header row intact. The template is in comma-separated-values (CSV) format, and can be filled out in a spreadsheet programme (e.g. Excel or Google Docs), or in a text editor. For instructions on how to correctly open a CSV file in Microsoft Excel, please see this page. Please ensure the file you upload retains the CSV format. If you use a text editor, you will need to make sure you don't use commas in the data you enter in for each field. Match This field should contain the name of the person with whom you share this segment (if not provided, this will appear as 'not specified'). Confidence This field should contain a number between 1 and 4 that measures how confident you are in your identification of this match (1 is the lowest and 4 is the highest. Segments with a lower certainty level display in a more transparent shade) (if not provided, this will appear as '3'). Group This field should contain the the name of the group into which you want this segment to be placed (if not provided, the segment will be put in a generic group named according to the filename). SideThis field should contain 'maternal' if you want to paint the segment on your maternal chromosome or 'paternal' if you want to paint it on your paternal chromosome, or 'both' if you are uncertain (if not specified, the group will be 'unknown or both'). Notes This field should contain any notes you have on the segment. ColourThis field should contain a colour for the group. This can be a hex code or a named colour (if not specified, a colour will be chosen at random). Note: 'Colour' is used only if you have specified a side or new group name for the first time. 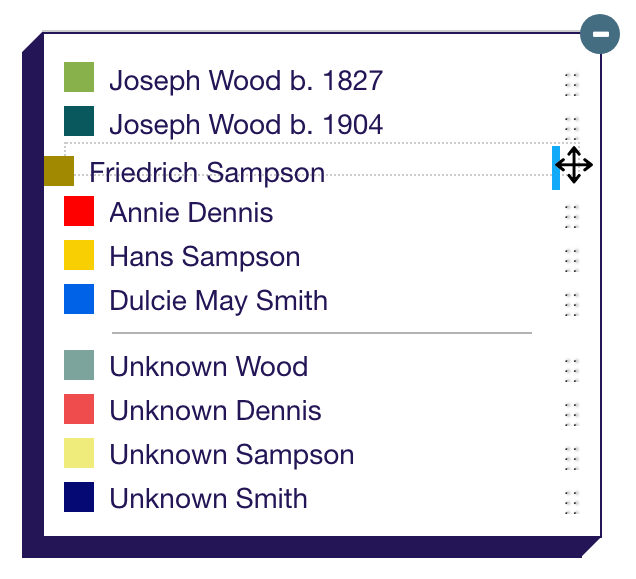 If you have multiple segments in a new group, the values for 'side', 'colour' and 'ancestor' from the first instance of that name will be used. If you don't have data for a column/value, don't delete it - just leave it blank. Once you have your file, you can upload it below. This process is likely to add a significant number of segments to your profile - from the low hundreds to several thousand, depending on the number of matches you have. This is likely to slow your profile page down. By default, the site will exclude close matches with more than 1,800cM shared (raise this limit to include these). It will also exclude any matches you've uploaded before from this testing company, provided you leave the original name intact. You might have to scroll down to see them all. Unless you click 'undo', the segment removal will be saved when you next make a change to your profile. new segments over (or with no cM value set) imported for matches. Note: If you retain the threshold and match names as imported, DNA Painter will automatically skip these matches when you next import the data. All groups with names beginning 'ftDNA' were checked, but no matching match names were found. Some ftDNA matches have been moved to Maternal and Paternal ftDNA groups according to the information in the Family Finder matches file you uploaded. You'll see these groups at the bottom of the key on the right. Your profile did not save locally due to lack of available space. Enter a match name here and click on a result. Matching segments will be shown below. A maximum of 30 results are shown here. Type additional characters to refine the results. Show names on segments in the group overlay by default? Show keylines on expanded chromosomes? Show match names on segments? Click 'Paint a new match' and paste in match data to start painting. Click and drag here to reposition the key. You can also click and drag on the top and left borders. Widen the key by dragging on the right edge. Where do I find the data I need for chromosome mapping?